Our toppings option this time over at STB is TAGS! However, if your not a toppings kind of person just stick with the usual Birthday Theme. I have linked up both above images so you can head on over to STB and Join us! By the way…you won’t want to miss the Design Teams fabulous work! Categories: Cards | Tags: Card making, Cards, Happy Birthday, rubber stamps, stamping, tags | Permalink. One of my favorite colour combos and you know I’m loving the flowers and polka dots 🙂 Great card! Very pretty card! I love the dotted tag and the flower with the bling! The pink and black combo is always a winner! Gorgeous. Love your tag and the pretty colors. This is fantastic! Love the patterns and textures. Fabulous flower too! 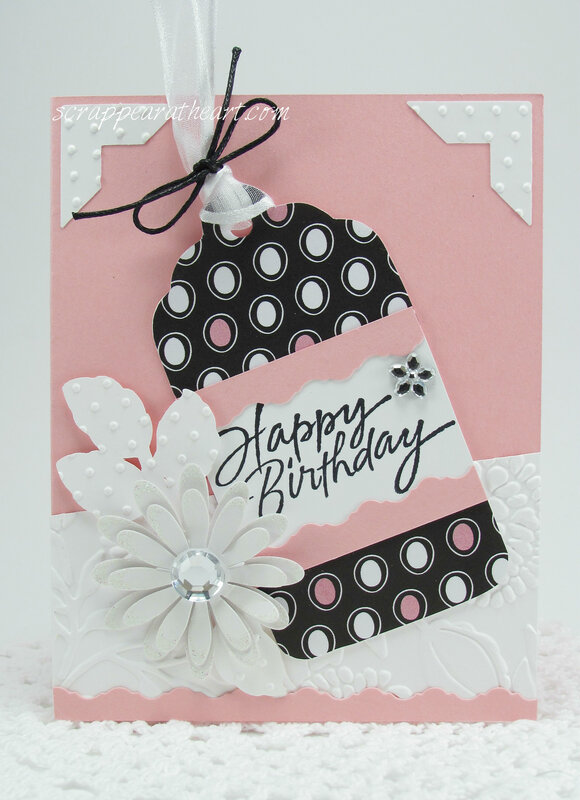 LOVE the colors, the polka dots, the tag, and the embossing! FAB card, Nancy! Love your card this week Nancy. That tag with the black really pops! Love the paper on it too. Very pretty card Nancy, I love the pink and black together.